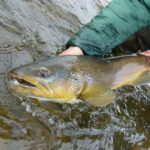 FishTales Outfitting LLC and the J Bar L Ranch Fishing Cabin are offering special rates on guided fly fishing and lodging packages. We are happy to provide custom quotes, simply give us a call 406.842.5051 or contact us here! This deluxe fly fishing cabin has one bedroom with a king-sized bed that is divisible into two extra-long twin sized beds, a full bath and a living room with a comfortable queen-sized sleeper couch. The lovely living room and dining room have views of the Ruby and Pioneer Mountains. Bordering our hay meadows, the house is set next to a lively trough that is lined with cottonwoods. Relax with a good book on the screened-in porch, or just sit back and watch the deer and antelope in the meadow. The cabin is within a few miles of the Pennington Bridge boat ramp on the Big Hole, as well as the Beaverhead, Ruby and Jefferson Rivers.